Where else would you find a restaurant by the name of FARM but in Calgary, Alberta. From the minute I walked in and saw the wooden decor, a chalkboard filled with local food, food served on wooden boards and teacup plates for the bill, I knew I was in for a treat! 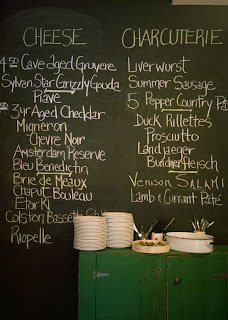 This restaurant is the love child of Janice Beaton's Cheese Shop - a local hotspot in Calgary. The food at FARM is inspired by the province and showcases the produce of local farmers. The layout of FARM includes an open kitchen which according to them is the "heart and soul of the place." You feel right at home, just like being in you're own cozy kitchen. The plates are perfect for sharing, especially the charcuterie and cheese boards, with come with perfect pairings of dips and spreads. Visiting FARM is a must-do on any trip to Calgary. They are famous for "Janice’s bubbling, mildly spicy mac n’ cheese" but I would also recommend ordering the house made tarragon mashed peas & house made lemon ricotta with crostini. The combination of the mushy peas, and lemon ricotta with a crisp crostini is perfect! A great dish to start off the night! FARM's wine list is equally as impressive as their food, both will not let you down. 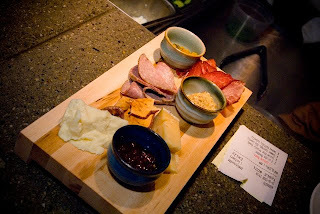 Get on over to FARM and make a charcuterie board from their long list on meats and cheeses!